WINTER HIKING & BACKPACKING BOOKS ! 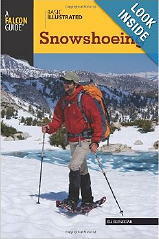 Basic Illustrated Snowshoeing - A visually packed beginner guide to snowshoeing. Hiking and backpacking are not just a three-season sport. With the proper equipment and knowledge, continuing to hike and backpack in the winter can be an exhilarating experience. Winter hiking is quieter, with less people, and NO BUGS! The following books are very helpful in understanding the requirements and techniques needed for winter hiking & backpacking. Visit the Winter Hiking & Backpacking page and also the Winter Hiking & Backpacking discussion forum.